that calculates average global temperature based on the physical phenomena involved. Reference 1 and links given there. radiated from the planet and thus the planet warms. Not long before climategate broke at the end of 2009, Steve McIntyre requested some assistance from readers at his blog Climate Audit. In the long running battle with the Climate Research Unit at the University of East Anglia over access to the CRUTem dataset, attempts to obtain the information under the Freedom of Information Act had been thwarted by the CRU’s use of various exemption clauses. One of these was it’s claim that binding written agreements with other countries prevented them from disclosing it to non-academics. Steve asked readers to make FOIA requests for copies of these agreements. I picked three countries, including Cuba, and duly sent off my request, which was refused some weeks later on the grounds that the agreements were themselves confidential. However, despite not wanting to share their confidential information with me, the CRU’s FOIA officer had no compunction in sharing my confidential information with the Norfolk Constabulary in the wake of the release of emails and data which became known as climategate. In the course of their investigation of the alleged ‘hacking’ the police contacted me and requested an interview, so they could ascertain if I may have been the ‘Hacker’ who obtained the emails and data. 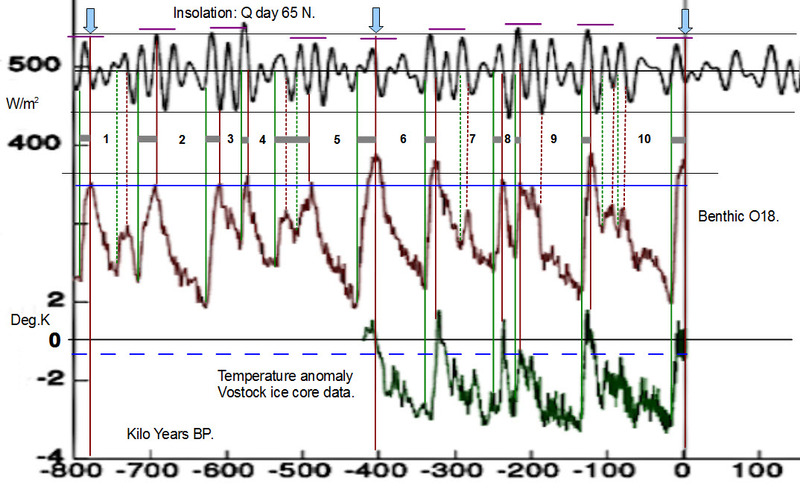 Over very long periods of time as ice ages come and go, it has been found that temperature leads atmospheric CO2 content by about 800 years. 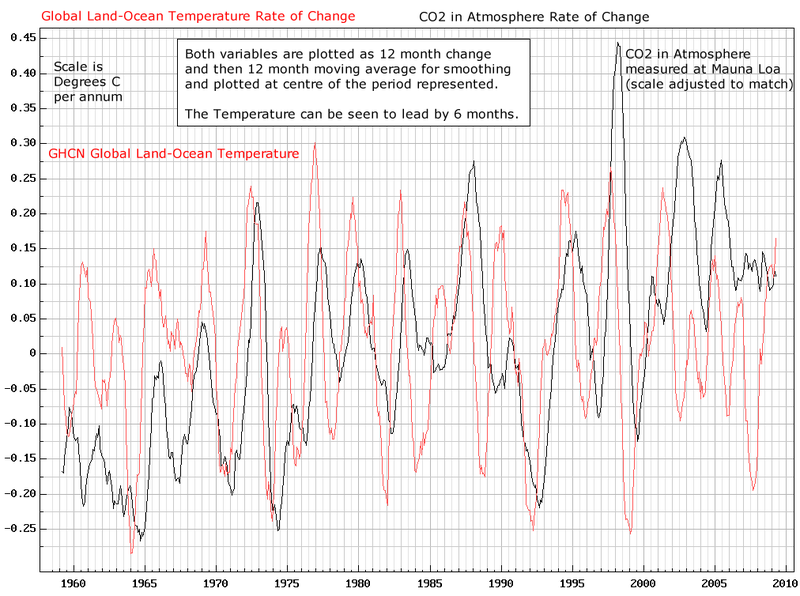 This seems to contradict the IPCC and other views that CO2 causes change in temperature. But we are looking at very different time scales with present changes, so perhaps things happen differently. I decided to examine this question. The temperature data used is monthly global land-ocean temperature or GHCN, which is available from NOAA. The atmospheric CO2 data used is from Mauna Loa in Hawaii, the longest continuous record of CO2 also available monthly. When wanting to find the causation when two series are both increasing over time, it is best to look at the rate of change of the variables as this will show clearly which one precedes the other. This first graph shows the rate of change of these two variables monthly over the period 1958 to 2009. This might be a good time for those who live in the E.U. to ask their pension fund managers how much exposure they have to this market. 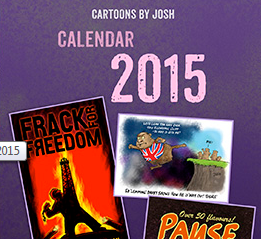 We know the BBC pension fund is heavily invested in green tech and carbon mitigation. I wonder how much they have in carbon credits. The recent fall is partly due to the Greek government attempting to auction a million creds, of which only 6000 sold. Not a big confidence booster. How much more E.U. money will be frittered on propping up this failing market? Update 28-6: The graph doesn’t update. 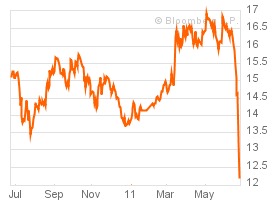 The price rallied a dollar yesterday. Is this the dead cat bounce? supports a model where the jet energy ﬂow is mainly electromagnetic. Solar energy emission varies on all timescales right out to the change into a red dwarf, or so that particular theory goes. Solar physicist and full time blog contributor Leif Svalgaard has for years had solar data on his ironing board. Now he has gone a step further than usual with the following statement. 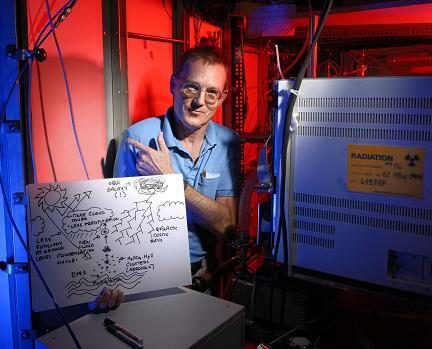 The Far Ultraviolet [between EUV and UV] creates and maintains the ionosphere and solar tides move the ions during the day and night cycle giving rise to an varying electric current whose effect we can easily measure on the ground [it was discovered in 1722]. This effect is a very good measure of the FUV flux and follows the solar cycle very closely, e.g. slide 9 of http://www.leif.org/research/Rudolf%20Wolf%20Was%20Right.pdf , and shows no long-term drift of change. Claus Froehlich notes: “The Ca II K index from Mt. 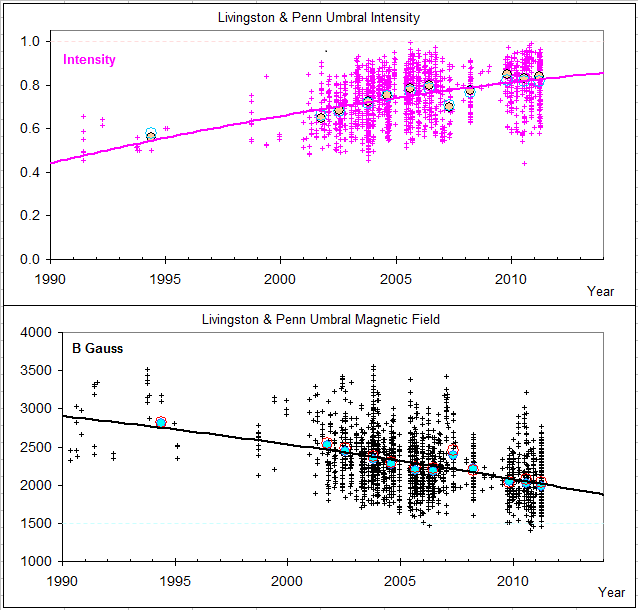 Wilson observatory shows no secular trend of the minima since the start of these observations (Foukal et al., 2009; Bertello et al., 2010). 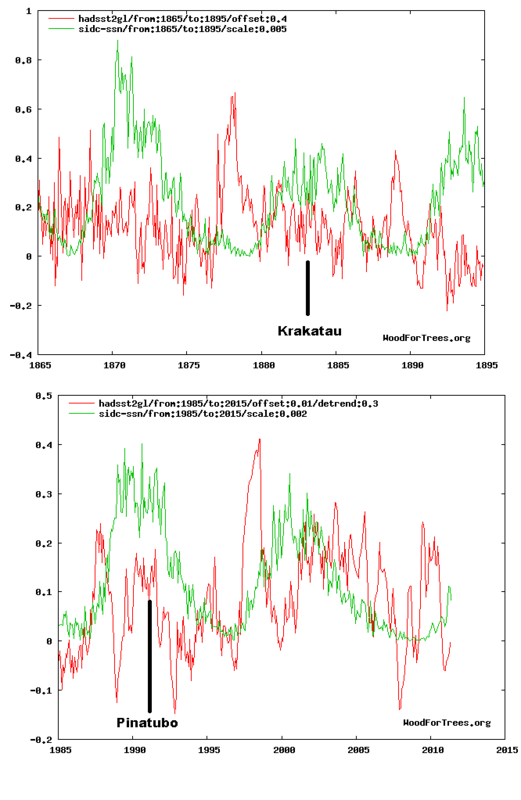 This confirms also the result of a recent study of the long-term behaviour of solar like stars by Judge & Saar (2007), which shows that non-cycling stars have a HK index similar to the one observed on the sun during recent minima.” So, there is good evidence that the UV and TSI was not significantly lower during the Maunder Minimum. 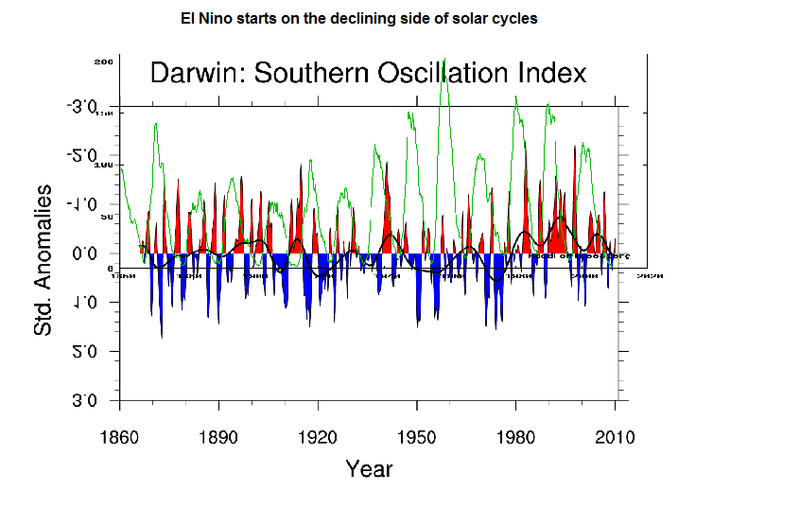 On the very busy and interesting El Nino in relation to solar cycles thread Erl Happ made a comment about volcanos and El Nino which reminded me about a graph I did of the similarity between late C19th and late C20th solar slowdowns and the El Nino events occurring at those epochs. I ‘ve made a new pair of graphs to improve clarity and to include the timing of the two biggest volcanic events of the last 120 years. asymmetries in the motion of the Sun about the CM of the Solar System. The peak of volcanic activity also coincided with the activation of other processes in Earth’s crust that resulted in the succession of powerful earthquakes. Although they happened in places with the increased seismic activity, this is not very comforting. Since volcanoes and earthquakes are usually associated with one another, it becomes clear that something is happening to the planet. 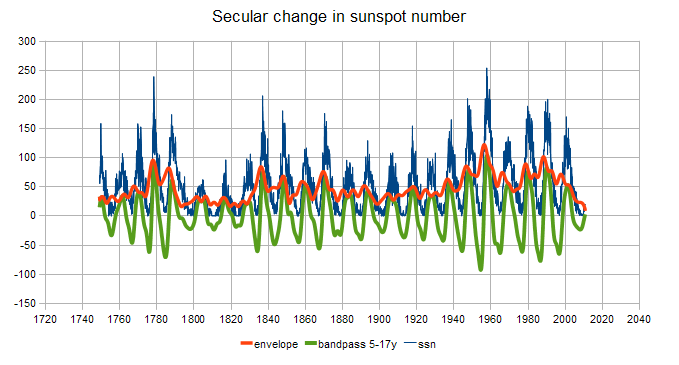 Andy Revkin over at dotearth, his more than lukewarm blog on the New York Times, has posted a critique of the announcement of a likely grand minimum in solar activity, written by NOAA solar scientist Douglas Biesecker. This page links the google doc and also a powerpoint slideshow. I’ll alert the group that came out with the prediction of a new minimum. This debate will need to play out in the peer-reviewed literature, of course. And the Sun, in the end, will determine who’s right. Well of course Andy, empirical data is the final arbiter. And naturally, the issue can now be kicked into the long grass while we wait for the journals to get around to publishing the resulting to and fro. The thrust of Biesecker’s argument is the uncertainty inherent in the extrapolation of trends from short datasets. Something his colleagues at NOAA who draw conclusions about other aspects of climate change should take careful note of. Researchers who have predicted a long term solar minimum or ‘solar hibernation’ and/or a new climate change to a period of long lasting cold weather based upon solar activity. 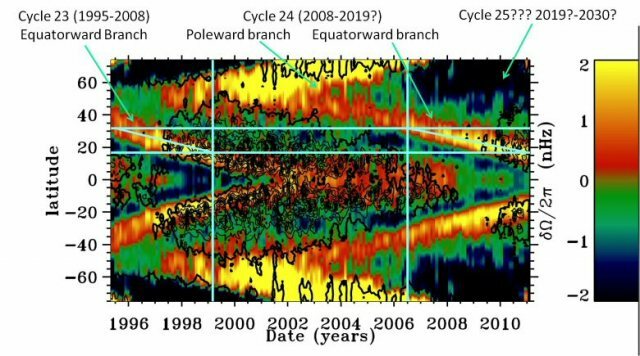 From the center’s research report: Casey, John L. (2008), The existence of ‘relational cycles’ of solar activity on a multi-decadal to centennial scale, as significant models of climate change on earth. 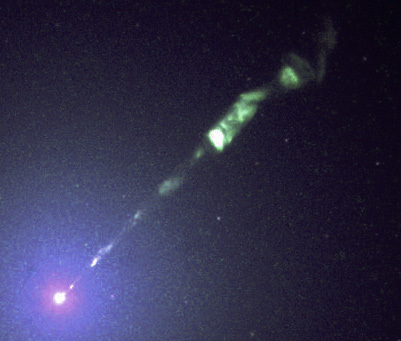 SSRC Research Report 1-2008 – The RC Theory, http://www.spaceandscience.net. 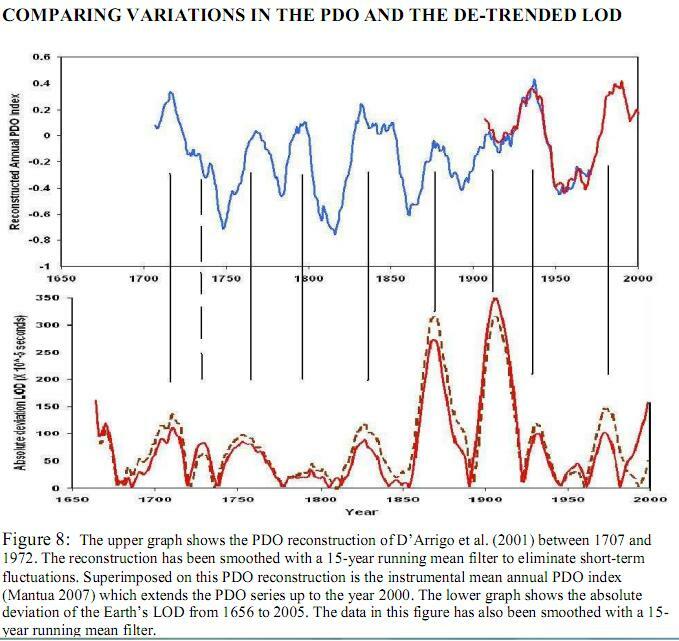 After years of pooh poohing Theodor Landscheidt’s methods, work and predictions, mainstream solar physics has made an announcement of the strong possibility of a protracted solar minimum with consequences for Earth’s climate. 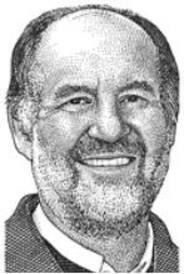 The implications are enormous, but don’t come as a big surprise to readers of this blog or WUWT’s solar threads, where a group of planetary theorists, including Geoff Sharp M.A. Vukcevic, Patrick Geryl and myself have been trying to tell all who will listen that far from the big solar cycle 24 predicted by the mainstream physicists, the sun was likely going to quieten down for a long spell. Leif Svalgaard’s predictions for a solar cycle 25 bigger than the current low cycle, made as recently as a fortnight ago, now seem to be in doubt. 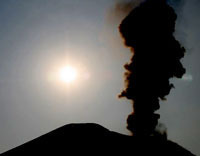 More Earthquakes and volcanoes as Sun goes blank again at Lunar perigee. If there were any doubts about the link between low sunspot count, big isolated solar flares, Lunar perigee/apogee and heightened earthquake and volcano activity, events of the last months should have dispelled them. Magnitude 6.0 and 5.5 quakes near Christchurch NZ in the last 24 hours, plus the quakes and eruptions in Ethiopia, Chile, Kamchatka and Iceland are a reminder of the global aspect of the upsurge in seismic activity since the start of low solar cycle 24. 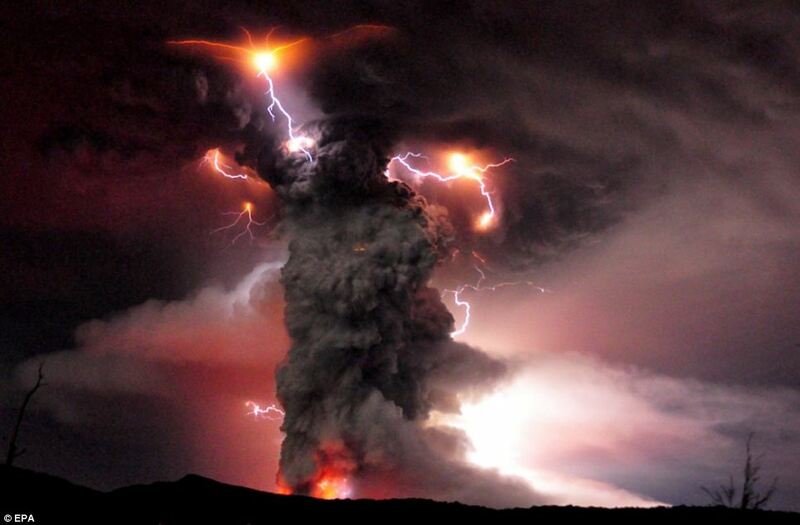 Our sympathy goes out to all those affected by these frightening and destructively powerful natural events. 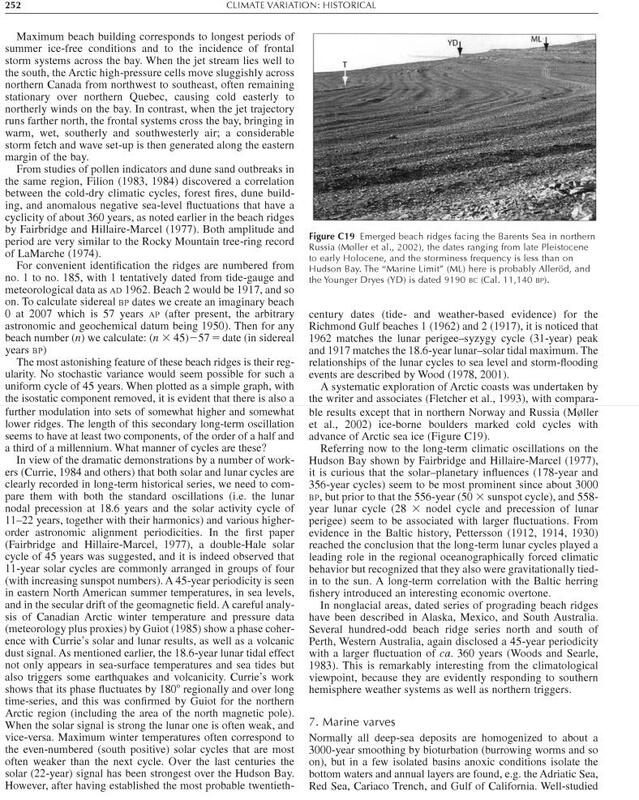 I’ve been challenged a couple of times by Bob Tisdale to substantiate my claim that ENSO (El Nino Southern Oscillation) is related to the solar cycle. I have said that El Nino tends to start occurring on the declining side of the cycle, the big ones at or just after solar minimum. Regular contributor Michele Casati has produced some superb graphics showing possible links between Solar-Planetary indices and terrestrial events such as earthquakes and volcanos. There is a wealth of information on these beautifully produced graphics, be sure to click for the high resolution versions, which will be updated in the future.